Looking for a light chicken wings recipe? I have one for you, along with a light chicken wing sauce recipe. With the invention of hot wings, these things have certainly come into their own, so to speak. I remember when they first became popular and widespread, my dad was astounded. He owned and ran a grocery store for years, and at the time, he could hardly give the bony little parts away. Too bad Dad retired and sold the store before he could market wings. Now they’re everywhere – in fast food joints, in restaurants, at backyard barbecues, at picnics, and at sports bars. Chicken wings can be served as appetizers, snacks, or even as meals. 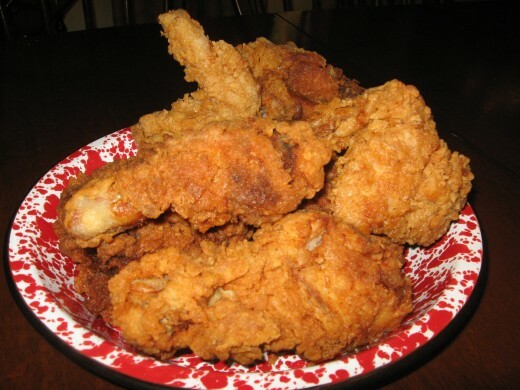 There must be literally thousands of chicken wing recipes in the United States alone, and every cook and wing fan probably has more than one favorite. Chicken wings, unfortunately, aren’t always diet-friendly. They’re high in fat, and they’re usually fried in more fat. Then they might be dipped in a buttery sauce, which adds a lot more fat. Do you have to avoid these tasty treats completely? Nope, because I’m sharing a light hot wings recipe with you here! How did the whole hot wings craze, start, anyway? I remember the first time I ever heard the term. Like most people, I was thinking that buffalo don’t have wings. Of course, it didn’t take me long to discover that they were actually chicken wings – big difference. It didn’t take me long to find out that I really liked the little suckers, either! So…how did the famous Buffalo wings originate? Actually, from what I can find, no one is exactly sure. There are several theories floating around. 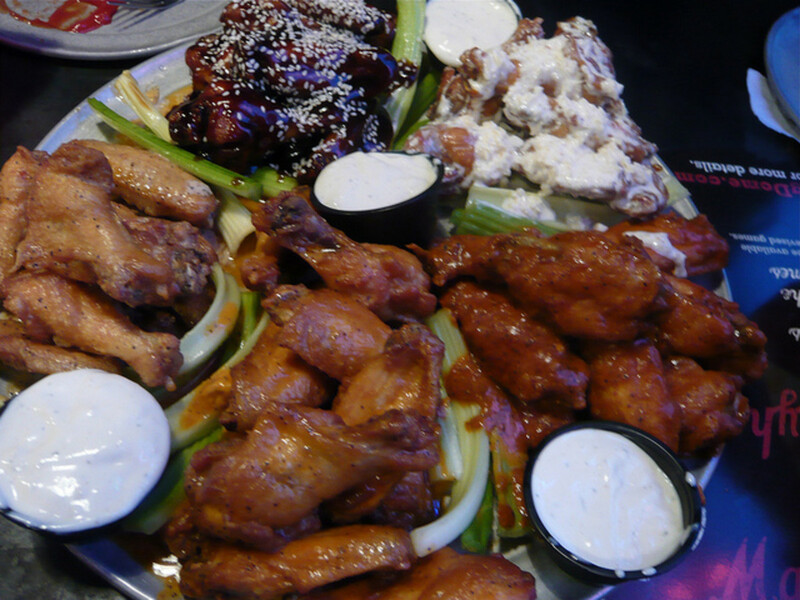 Most claim the first buffalo wings were created at the Anchor Bar, located in Buffalo, New York. Another claim is that the wings were first made in John Young’s restaurant, also located in Buffalo. Well, one thing’s pretty obvious – at least we know how the chicken wings got their name. It’s also interesting to note that residents in the New York city don’t refer to the morsels as “Buffalo wings.” Yeah, I guess that would be sort of redundant for them, right? You can make easy chicken wings at home, so there’s no need to have to get dressed and drive to your favorite restaurant or sports bar. How difficult and involved the process has to be is totally up to you and your taste buds. A chicken wing recipe can be grilled outdoors on the barbecue, fried in hot oil, baked in the oven, or cooked on an indoor grill like a George Foreman. The traditional buffalo wings aren’t battered, but many wing aficionados prefer some crispy batter on their chicken wings. The easiest is undoubtedly a hot wings recipe baked in the oven. There’s no having to deal with hot oil, and you don’t have to fire up the grill. Chicken wings in oven recipes often include a marinating step, but you don’t absolutely have to follow that method to get yummy results. 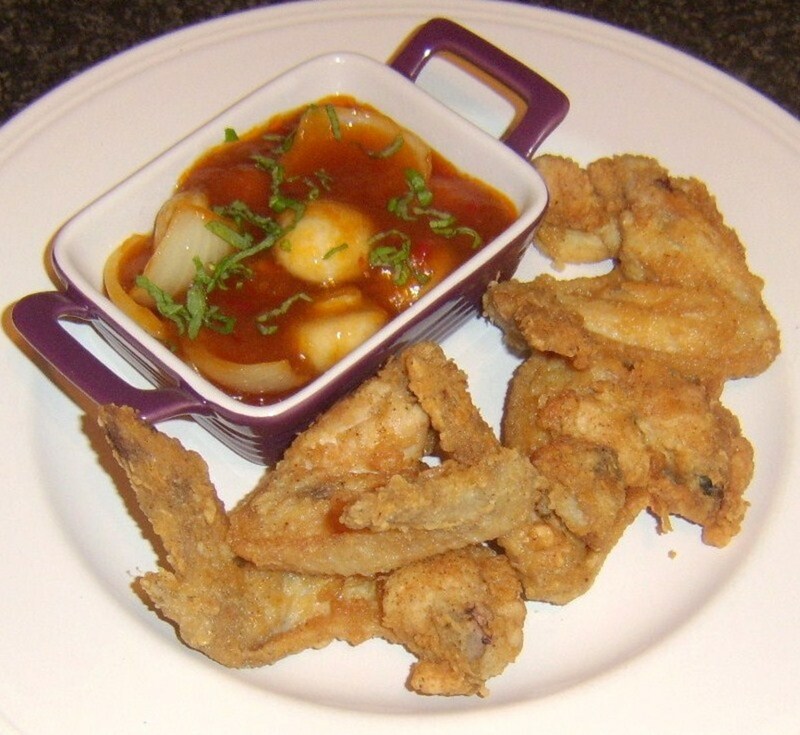 A chicken wing recipe can include many different seasonings for very different outcomes. Obviously, with a recipe for hot wings, you’ll use spices or sauces that add heat, but heat is variable and relative. In restaurants and bars, they might offer several different heat levels: mild, medium, hot, and inferno. You can easily adjust the heat at home by altering the amounts of spices and hot sauce you use. Easy chicken wings that you bake don’t have to include any heat, at all. You might prefer the flavors of teriyaki, barbecue sauce, honey mustard, Asian sesame, or sweet and sour for your chicken wing recipe. 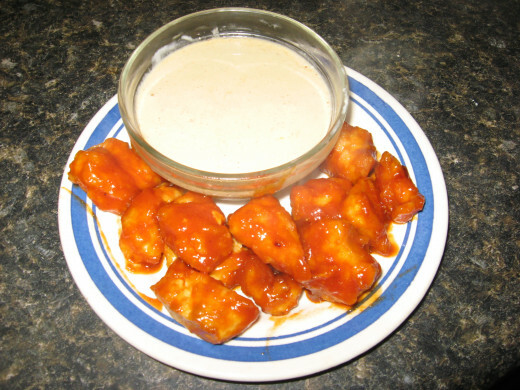 Italian salad dressing and ranch dressing mix are both great for wings, too. Even a dry mix of herbs and mild spices can add a lot of flavor to plain ol’ wings. You’ve probably enjoyed boneless buffalo wings in restaurants, but have you ever wondered how to make them at home? Where can one buy boneless chicken wings? I do a lot of food shopping, and I’ve never seen the uncooked version in supermarkets. When I’ve ordered them in restaurants, I always pictured some poor employee meticulously removing the small bones and skin from the spare chicken parts. Well, guess what? Boneless wings aren’t actually chicken wings, at all. Nope! They’re actually made from boneless, skinless breasts. Sometimes they’re made from a specific part of the breast, the tenderloin. Maybe I’m just dumb, but discovering this fact was sort of a “eureka!” moment for me. It all makes sense now. Boneless buffalo wings have some definite advantages over their bony cousins. They’re easy to make at home because they cook quickly, and they’re easier to eat because you don’t have to deal with skin, bones, and cartilage. They’re also much healthier because without the skin, the fat content of the chicken is dramatically decreased. That’s why I use boneless wings in my light hot wings recipe! This recipe for hot wings is for boneless chicken wings. It’s “light” in three different ways. It’s much lower in fat than traditional hot wings, it’s almost carb free, and it’s not as hot as some buffalo wings are. I like a “sweet heat” sauce, so I added some Splenda. You might want to omit it, though. For a hotter sauce, add some Tabasco and/or some cayenne. Rate my recipe for hot wings! Thanks! 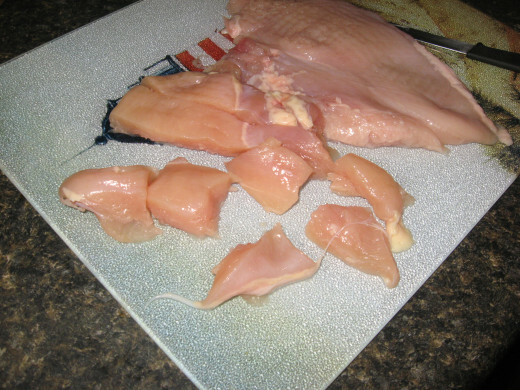 Rinse and dry chicken breasts. Trim away any fat and gristle. Sprinkle poultry with Lawry’s garlic salt and black pepper. 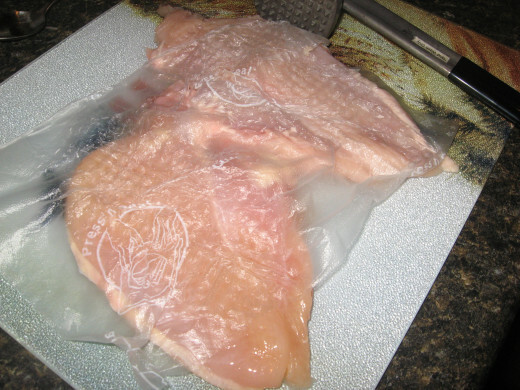 Place breasts on a heavy cutting board and cover with plastic food wrap. Use a meat mallet to pound breasts to a uniform thickness of ½ inch. Cut flesh into cubes. 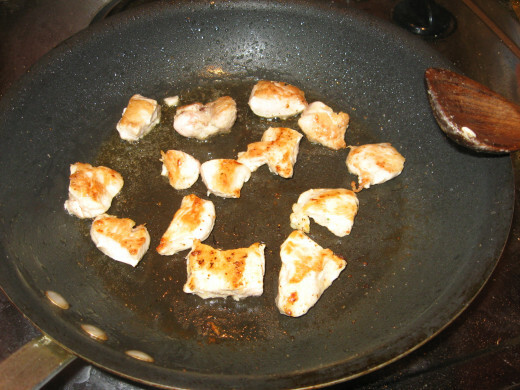 Heat oil in a non-stick skillet, over medium-high heat. I had mine just one notch above medium. Add chicken and brown on both sides. To get nice crispy edges, I cooked just one cut-up breast at the time and didn’t let the pieces touch each other. When chicken is brown, drain on paper towels and make the sauce. 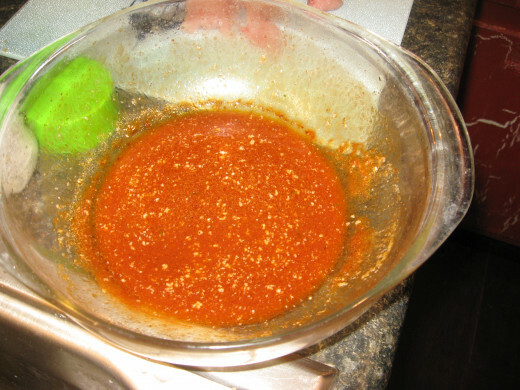 In an oven-safe glass bowl, combine hot sauce, ketchup, butter, lime juice, Worcestershire sauce, and Splenda. Heat in microwave until butter has melted. Stir well. 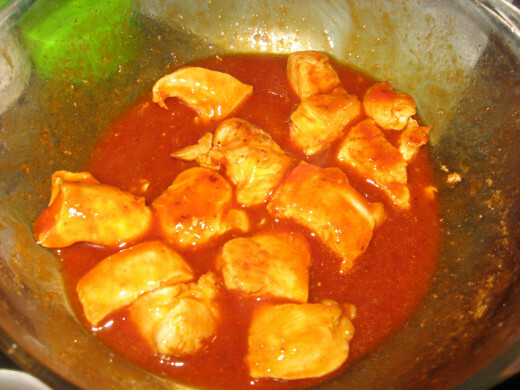 Add cooked chicken to sauce bowl and toss to coat. Bake at 350 degrees until chicken is cooked through. This took about 10 minutes in my oven. One of the best parts of eating hot wings is the dipping sauce that’s often served on the side. Many times, these will include blue cheese dressing or ranch dressing. Ever wonder why these two condiments are often the preferred chicken wing sauce? It’s to counteract the heat. 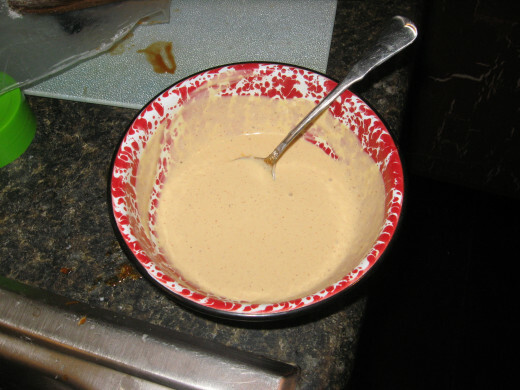 Both types of dressing contain dairy products, which are known to be able to put out food fires on the tongue. Both dressings are fine, but you might like something a little different, so I’m sharing a homemade low-fat chicken wing sauce with you. 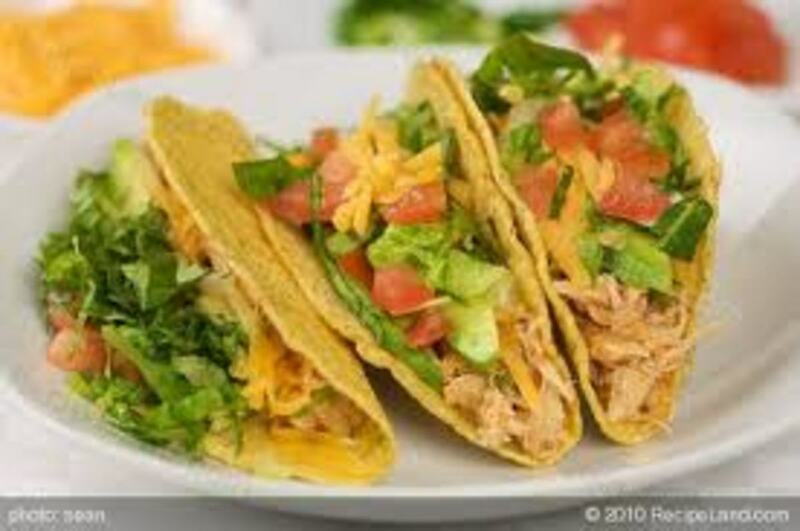 You’ll need ¼ cup fat-free sour cream OR fat-free plain yogurt, ¼ cup Walden’s Farm calorie-free Dijon mustard salad dressing, one tablespoon lime juice, one teaspoon paprika, and Splenda, to taste. Whisk everything together and cover. Chill in refrigerator until ready to serve. Ooooh - great idea! We love the flavoring, so why not use a better cut of meat here and there! I like the chicken breast idea - gonna try it! I needed a light chicken wing recipe for a long time, Holle. Thanks for so ably filling that surpassing need. Holle Abee....This sounds like a must try easy recipe !! Absolutely going to give them a try...thanks for sharing. I'm going to have to make these for my husband and his friends during the football games. They look so good. I think I am going to try the boneless chicken wings recipe because there is never enough chicken with the regular chicken wings. Light is a great idea. I am not a fan of spicy wings. Will definitely be trying this sauce. thanks! What a clever idea! Thank you. Also mouthwatering indeed. So many ways to eat these little morsels. I love them! Great recipe. I love steak, and I've never seen a hamburger I didn't like, but for day in, day out food, nothing beats chicken for this boy. Great recipe that I will use for sure.